This page can be accessed in pdf format here. A business plan is integral to every successful business. It doesn’t need to be very long or time consuming to produce, but once you have written one, it’s important to make sure that you use it to manage your business. If you just put it in a drawer and forget about it then it won’t help you to become successful. Business plans should be constantly reviewed to check whether you are achieving what you set out to. Including basic information about the organisation, contact details etc. It’s important to describe the services that you provide and any new services that you intend to develop including information about opening hours, the age range of children that you look after, the number of children you are registered for and information about your quality standards and expectations. This section should be about the type of organisation that you are (e.g. sole trader, private limited company, company limited by guarantee, voluntary committee-run group), who is involved in the management of the organisation, what their roles and skills are etc. If you are considering changing your legal status, you should include information about that. If you have a constitution or governing document and an organisational chart, you may want to include that. Including information about your premises, policies and procedures, and processes for administration such as late payment etc. This section will include information about your surrounding area and who your customers and competitors are. You could also include any information about links to partner organisations such as schools. Any market research that you have done should be summarised with the key analysis included in this section. Your marketing and sales plans and ideas should also be included here. Including details of staff employed, their hours, rates of pay, qualifications and specific roles and responsibilities. You should include your annual budget and cash flow forecast here as well as explaining the underlying assumptions that have helped you to reach your figures, such as your likely occupancy levels and staff requirements. You may also want to include information about your break-even point and pricing structure and policies here. Details of any quality awards held and information about your recent Ofsted inspections should be included here together with any plans for improvement and development. You may want to include an overall action plan for business development, particularly if you decide that there are lots of changes that you want to make or things that you want to develop. 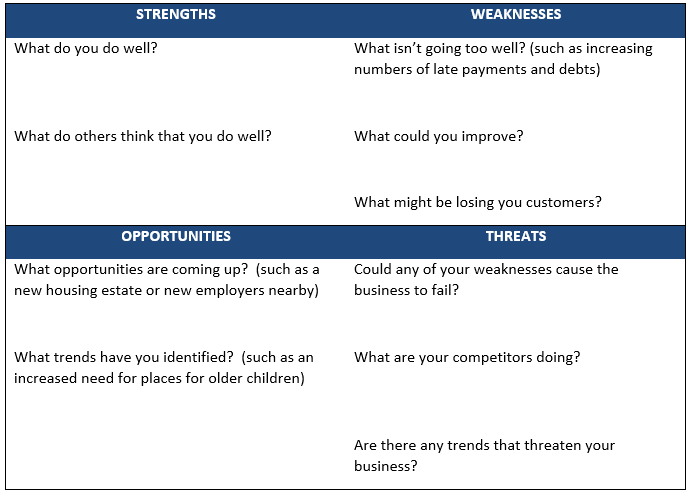 It might be useful to undertake a SWOT analysis (see below) early on in your business planning process, as this could help you to identify particular areas for work. Lots of templates are available online that you can use to help you put your plan together, or you can write one yourself. A SWOT analysis is a simple tool to help you to analyse the strengths and weaknesses of your business so that you can plan to make the most of your strengths and address any weaknesses. It also helps you to think longer term about what opportunities might arise for your business and what threats could damage your business. You might find that having a few colleagues, or even customers, do the SWOT analysis with you is helpful and gives you different perspectives on your business. This is an updated version of the DfE-funded 4Children Business Health Check published in 2013, which was transferred to Action for Children on 1 September 2016.